The Chairperson of the African Union Commission Moussa Faki Mahamat has praised the positive contributions made by Morocco to the various UA projects and programs since the North African Kingdom rejoined the African bloc last year. 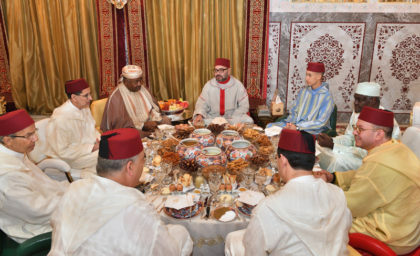 At a meeting in Rabat with Head of the Moroccan government Saad Eddine El Othmani, Mr. Mahamat, who attended Tuesday an Iftar (the breaking of the Ramadan fast) hosted by King Mohammed VI in honor of Gabon’s President Ali Bongo Ondimba, hailed the country’s noteworthy input to the African free trade area, the protocol of free movement of people in the continent, the African air transport agreements and the African security fund. Chairman of the AU Commission also thanked the North African Kingdom for its initiatives on migration, its valuable contributions to the socioeconomic development of several African countries and the regularization of the situation of thousands illegal African migrants. Mahamat’s talks with El Othmani also covered cooperation prospects between Morocco and the AU in the fields of agriculture, renewable energies, sustainable development, education and vocational training. El Othmani renewed Morocco’s commitment to enhancing partnership with the AU and supporting all African moves seeking to foster peace and stability in the Continent and speed up its inclusive development. The AU Peace and Security Council approved lately a proposal made by King Mohammed VI to set up an African Migration Observatory. The Moroccan Sovereign, who was appointed by the African Union leader on the issue of migration, had called for the setting up of an Observatory to better “understand, anticipate and act” on migration issues. In recent years, Morocco has become a country of destination rather than a transit country for refugees and migrants, aiming to reach Europe. In this connection, the North African Kingdom launched regularization plans for migrants and refugees, who wish to settle in the country.